A few weeks ago, John and I took a trip to Alaska... America's last frontier! We spent the first part of our trip adventuring in interior Alaska and the second part of the trip exploring coastal Alaska. The whole trip was absolutely incredible, and there is zero doubt in my mind that we will be back again some day. Once we landed in Alaska, we picked up our rental car (which, with John, is always a rental truck), and drove the 4 hours from Anchorage to Denali... our first stop: Denali National Park! On our drive up to Denali we were so excited to actually be able to see the mountain. Only about 1/3 of people who travel to Alaska actually get to see Denali (due to all of the cloud coverage and weather conditions at 20,000+ feet elevation), and we were so fortunate to have beautiful views of the mountain all 4 days that we spent there! In fact, we were talking to another traveler, and he said it was his 5th time to Alaska, and this was his very first time actually seeing the mountain! Our first day in Denali was spent on the hop-on-hop-off bus. With your personal car you can only drive about 15 miles into the park, and to go any farther you need to take the National Park buses. The full bus loop takes about 7 hours (give or take an hour depending on the wildlife you stop to see), and you can get off the bus at any point to start your hike. In Denali there aren't any trails, so all hiking is based off of landmarks - which makes for a fun, but never-sure-if-you're-quite-right kind of experience! Our guide book had instructions like, walk 20 feet, keep the pond to your right, hike until the mountain run-off ends... and I'm all like - wait, what?! Hiking in Denali was unlike any other hike that we have done... and if there was one word that I could use to describe it, it would be "wild." We hiked through heavy brush, came across a grizzly bear (that was way too interested in us...), and "met" a number of Dall sheep that were keeping a close eye on us! Although the sun was shining the whole time we were hiking, it was quite cold (well, for me at least!)... I'm just thankful it wasn't rainy because at 50 degrees, I was quite chilly! We spent a large portion of our hike hiking in tundra and the ground literally felt like we were walking on a sponge from all of the moisture... praise God for Gore-Tex hiking boots! Everything about Alaska, and specifically Denali is so vast... the mountains just go on forever and everything is so untouched - I hope that it stays this way over the years so that it can really be enjoyed in it's natural state. In addition to a grizzly and Dall sheep, throughout our trip we also saw moose, caribou, fox, marmot, mountain goats, bald eagles, and all sorts of other critters! After our hike and exploring Denali we headed into Glitter Gulch (which is basically Denali's very small touristy area). We ate dinner at the Salmon Bake and enjoyed some ridiculously delicious fish and chips... a perfect end to a long day of hiking! In Denali we stayed at McKinley Creekside Cabins... and it was so great. Our cabin was literally on the river (which was a beautiful sound to fall asleep to!) and had beautiful mountain views. We enjoyed a large portion of our evening just sitting by the river and relaxing. Although it looks like broad day light in the photo below, it was actually taken after 10PM. In Alaska, during the summer the sun doesn't set until around midnight and the sun starts to rise around 4AM, and since it isn't "night" for very long, it doesn't even really get all that dark after the sun sets. The whole time we were in Alaska, we didn't see darkness once! Our next day in Denali we spent with the Alaskan sled dogs. We weren't sure what to think at first (whether or not it was going to be too touristy), but we absolutely loved it! The demonstration was put on by the National Park, and we were able to meet and greet all of the dogs (that are still working within the park pulling sleds of supplies during the winter). After Denali, we headed the two hours to Talkeetna where we were staying at the Talkeetna Alaskan Lodge. The lodge was amazing and is known for their beautiful porches which have the best views of Denali... and lucky for us, Denali was showing off all week! People staying at different places in Talkeetna will often come to the lodge just to check out the view - and we were so fortunate enough to have the below view from our hotel room! I couldn't help but capture a (at the time) 18 week Alaska bump photo. I have been feeling great all pregnancy, and felt very fortunate to not be missing a beat keeping up with John and all that he had planned for us. And I'm pretty sure the little babe had just as much fun... he was all sorts of rockin' and rollin' in my tummy throughout the trip too! One of the can't-miss things in Alaska is a bush plane tour on a sunny day... we just couldn't say no! 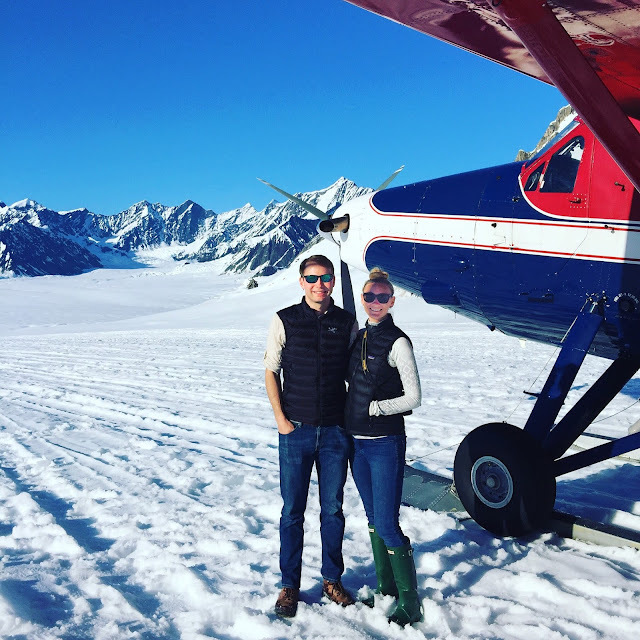 Our plane took off in Talkeetna (about a 2 hour drive from Denali), and we flew back into the National Park to see the mountain and glaciers up close and personal. About an hour or so into the plane ride, we made a glacial landing (you know it is legit when they use standing up sleds as landing markers!) and were able to get out and explore for a little bit. It was SO cool to actually be in the middle of all of the mountains on the glacier. The snow was quite wet, and there were places that you would step and be knee-deep. I was a little concerned about flying pregnant since the cabin was unpressurized, but the whole flight turned out to be very smooth. The views were incredible, and it is certainly something we will never forget. Funny story: on the plane ride there were 7 other passengers (not including the pilot), and it just so happens that one of my coworkers from Arizona was also in Alaska and on the exact same trip as us... how funny is that?! Talk about small world! 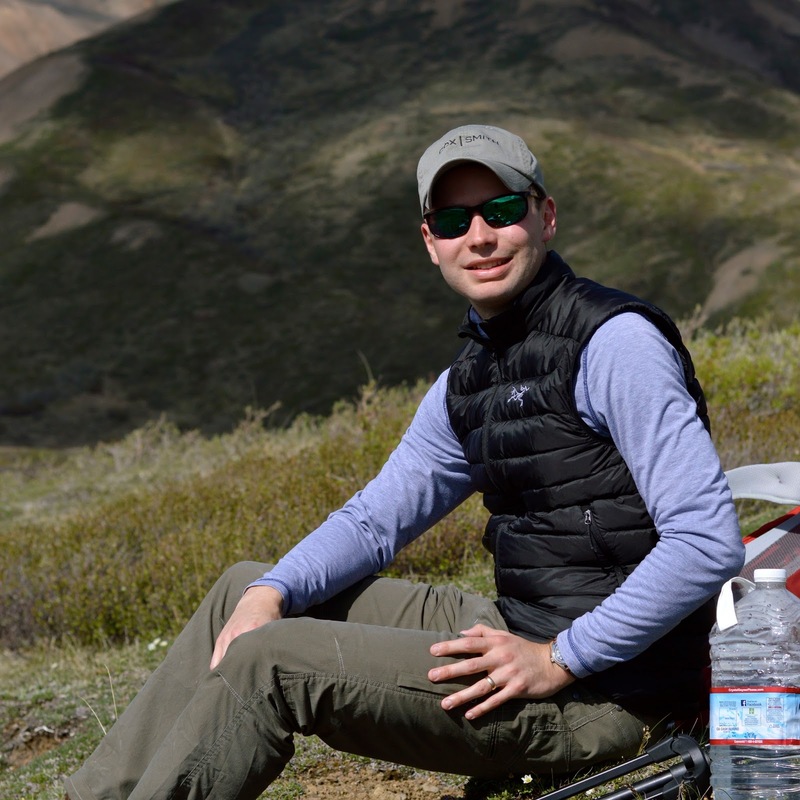 Our last day in Talkeetna was spent on a guided fly fishing trip on Montana Creek. Aside from falling into the freezing cold water and having my wading hip boots completely fill up with water and my clothes completely soaked through (which was colder than anything I hope you ever have to experience...), it was a pretty fun day! After falling into the water I was more interested in trying to dry out than pretend like I was going to catch fish, so I mostly sat on the boat as John reeled them in. He caught some beautiful rainbow trout and arctic graylings! After lunch I was feeling drier, and figured I would give the fishing a second shot, and after not too long, I caught my very first rainbow trout on a fly rod. I swear, John was so proud of me, I couldn't even believe it - I just love that man so much, and seeing him so excited for me made my whole day! All in all, it was a beautiful day spent on the river, and although we didn't catch a ton of fish, it was a total must-do item for our trip! I've even let John talk me into going fly fishing with him back in Texas - it may not be my favorite hobby, but seeing how much fun he had with us fishing together would definitely be worth another round! We had such an wonderful time exploring the interior of Alaska - it was the perfect mix of adventure while still be relaxing. Hiking, wild life, glacial exploring, bush flights, and fishing trips... it was a great time! Part 2 of our trip (coastal Alaska) coming up next! Sounds like such an amazing trip girl! Alaska looks so beautiful and those mountains!! Awesome that you guys traveled at the perfect time for them to be showing. Can't wait to read about the rest of your trip :)! This looks amazing! I would love to go to Alaska and I think my boyfriend would be all about this trip! SO much hiking and adventure. I love this trip! And I missed the pregnancy news, congrats! Alaska is definitely on my list. And the dog sledding looks like so much fun, esp the hanging out with the dogs part. Seriously a bucket list trip for me! Dying over all your beautiful pictures!!! This sounds like such an amazing adventure! I never knew that most people can't see the mountain...that's so interesting to me! Oh my gosh. Now I really want to go there!! It's looks so grow is and fun! I’m dying to visit Alaska - it looks so beautiful there! The hiking in Denali sounded crazy - I would’ve had an anxiety attack with those types of directions. And I surely would’ve gotten lost, haha! Your photos are all gorgeous! How amazing is this trip?! Did you have the midnight sun thing?! I'm dying to explore Alaska but you are so much braver than I am! Not sure I could do the small plane thing!! Love that teal jacket! This sounds (and looks) like such an awesome trip!! I was amazed when we were in Europe and it didn't get dark until after 10pm, I can't imagine it being light almost all day long. What an incredible trip! I can't imagine what it's like for it to be so bright late at night. It looks like you guys had some amazing food and such great weather, even if it was a bit chilly! Oh my goodness!! This just sounds like the most amazing trip ever!! I love seeing all y'alls adventurous trips!! Wow!!! What a cool trip! Y'all are awesome trip planners. That plane ride = amazing. You saw some amazing sites and got really great photos. Oh my gosh! These pictures are like something out of a magazine! What a fabulous trip! And your little baby bump...just precious! So much fun and SO gorgeous! We went to Alaska and we totally regret not going to the Denalli! We definitely want to make it back there some day too! Bump Update: The Countdown Begins!